You've decided to write one, three, or maybe even seven (heaven forbid!) articles per week to post to your blog, which means you'll have to come up with between 52 and 365 topic ideas over the course of a year. Ideally, you'll come up with many more times the number of ideas than you require, in order to stay motivated and inspired. To collect and save all those ideas, the first thing you need to do is start a list, also called a ‘swipe file'. You can use pen and paper, create a list in Word or Excel (spreadsheet), or, do what I do and keep a post of ideas right on your blog. I've queued that post for delivery far into the future so it always comes to the top of the list of posts. Once you've set up your swipe file, it's time to start filling it up. 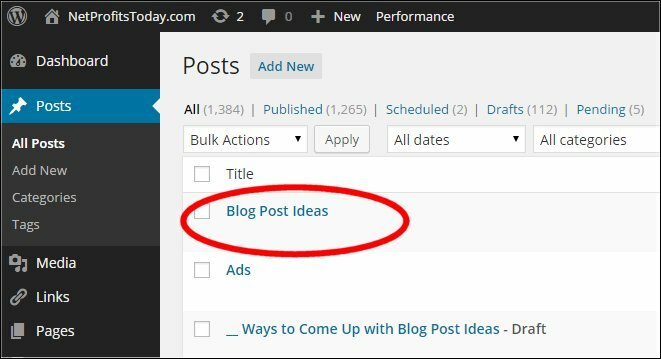 Here are ____ ways that you can use to generate ideas for your blog posts for years to come. My best source of motivation and inspiration to write on specific topics has always come from my readers. Their (your) questions are sometimes easy to answer and I can deliver an answer immediately to the person who asked the question or point them to the answer elsewhere on the blog. Other times, I must seek the answer elsewhere in order to respond. Simple or more challenging, I like to make a note of the question – because if one reader is asking, then at least 99 more also want to know the answer to that question. Here is an example of the type of question posted there. I’m new to affiliate marketing & considering being an affiliate marketer. I’ve bought books, mp3’s & reports on subjects in personal development, copywriting, understanding & using your subconscious mind, transformative living(overcoming obstacles), energy healing, spirituality, developing a wealth consciousness & creating financial wealth. I’m trying to decide which would be my main niche & secondary niche. I’d like a clarification & understanding regarding domains; Am I to buy 2 domain names for the affiliate marketing, ex: main niche is personal development, 1st domain is for it, then the second niche is copywriting, so would that be the second domain?? What approximate expenses am I having as an affiliate marketer? I recommend one site per niche, but not more than one. As for costs… your domain, hosting and autoresponder are all you really need to get started. Please read the following article – How much does it cost to start an online business? Note: The post that fielded questions from my readers kind of went south when I changed the theme of this blog in mid-July 2013. Since then I have relied primarily on reader questions submitted through comments posted to specific articles. You will now find the original post listed in the sidebar under “Recommended Reading”. Make note of your readers' questions in your swipe file. If you can't answer them immediately, let them know that you'll write an article in response to their question in the near future and then do it! If you're a blogger who is just starting out, you might not have many readers who will ask questions. If that's the case, you'll need to tap into your own experience in your niche and try to remember all the questions that you had when you were starting out. Use the 5 W and an H question words – What, When, Where, Why, Who and How – to prompt your memory. Here's a list of questions to get you thinking. What ____? What is a blog? What spices do I need to make Shahi Korma? ‘What' questions can inspire a whole FAQ (list of frequently asked questions). When ____? When are industry conferences held? When is the best time to plant tomatoes? If your niche topic involves a natural timeline (like gardening), when questions should be easy to create and answer. Where _____? Where do I find the best deals? Where are the best beaches? Where are the conferences held? Where are the best fishing spots for trout in the north-west? Why ______? Why are my seams puckering? Why can't I catch fish with this lure? Why does my dog eat shoes? Who ______? Who are the industry leaders in this field? Who can help me locate my lost brother? Whose books should I read about ____? Who was ___? How ______? How do I install a WordPress blog? How How questions should prompt you to write large numbers of how-to articles in your niche. Every blogger needs other bloggers who isnpire them to work harder and be better at their craft. If you don't already follow a few bloggers in your niche, go find them by searching Google for “your niche” and “blog”. Visit those blogs that come to the top of the search results and find those with whom you can really relate. Make note of posts that they've written that inspire you and have ideas that you want to share with your readers. I regularly check my favorite bloggers through Feedly. You can either post the good links that you find with a note in your swipe file, or bookmark the page for future reference. You should also be constantly looking for other sources of information pertaining to your niche by searching Google. I use a word document to note my ideas for one of my blogs. For another blog I’m basically using it as a journal to post my online marketing journey. My initial reaction was to post a reply about the “Akismet” WordPress plugin, which I activated on one of my blogs to weed out spammy comments. But then I realised maybe blog comments software just may have benefits. I’ll however check that some other time. I’ve been thinking about becoming a blogger and affiliate marketer for some time now and purchased your Supper Affiliate Marketing Handbook about four and a half years ago, yet never fully read it and put it aside because I was too overwhelmed with the process and unfamiliar with the online technology. I’d like to seriously begin again and start earning an income as an affiliate marketer but I have a few questions I’d like you to clear up if you don’t mind. First, with the book being over four years old are the concepts in the Supper Affiliate Marketing Handbook still applicable and up to date with today’s current on line media, affiliate market and blogging practices, or is there a newer more updated edition I should familiarize myself with that’s in line with the latest technology and if so what would you recommend? In terms of blogging, I have never officially blogged before other than for collage mandatory weekly assignment post. Do you recommend that I take a formal blogging class to familiarize myself with the rules of the game and sharpen my writing skills or is it considered okay for a beginner to set up a new blog site with affiliate links and realistically expect to earn a reasonable profit in a relatively short period of time? What’s the average learning curve time period for a new bloggers monetized expectancy rate? Also, one of the more daunting task I have never really wished to tackle is the seemingly arduous time consuming can’t get around it task of building an e-mail list. What are your thoughts on this? Please tell me I don’t have to build it; at least from starch that is. Also are you available for coaching and if so I’d like to contact you. Your 4.5 year old Super Affiliate Handbook will be somewhat out of date in terms of technology and social media marketing. However the business concepts remain the same as when I started affiliate marketing back in 1997. The newest version available is a year old and a new one will be coming down the pike within the month. If it makes you feel more confident about mastering the process, by all means take a blogging course. I offer one online at http://AffiliateBloggerPRO.com Having said that, it is absolutely fine for you to start blogging without the benefit of an official class. As to earning a ‘reasonable profit in a relatively short period of time’ – a lot depends on what you mean by ‘reasonable profit’ and ‘short period of time’. Too, your potential to earn ‘quickly’ depends on how much time you have to invest in your blogging project, and whether people in the niche market you choose trust your recommendations enough to purchase through your affiliate links. Moreover, you need to attract people to your blog. So, the short answer is – your success depends on you. Building an email list is hardly an ‘arduous task’. You simply place an Aweber form ( https://rosalindgardner.com/go/aweber ) on the sidebar of your blog and the rest is done for you, provided you deliver good information to those subscribers on a regular basis. Great info. I do like your articles.